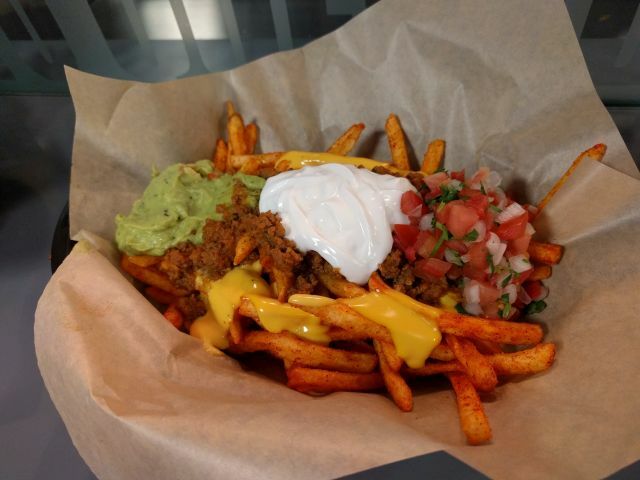 "Our fries are very popular in international markets, so you will see them on a lot of different menus. We’ve tested fries in the US previously. We’re always looking for new items to test, so if we see a good fit for a particular region, we would never say never to testing them again." So basically, Taco Bell has tested fries here before and aren't currently testing them now. They haven't just tested fries though, they've also tested Potato Crisp Nachos just last year. How were the fries? They were a bit soggy. I'm not sure if that's by design, like British-style chips or if they had just been sitting out for too long. That being said, there's a Mexican seasoning to them that gives a bold flavor as well as a nice kick. The toppings are regular menu ingredients and should be familiar to anyone who's eaten Taco Bell nachos. It was a combination of seasoned beef, nacho cheese sauce, sour cream, pico de gallo, and guacamole. I liked the flavor but not the lack of crispness.